International Criminal Court (ICC) judges have ordered the immediate release of former Ivory Coast president Laurent Gbagbo after rejecting a prosecution appeal to keep him in detention pending an appeal against his acquittal. By majority--Judge Herrera Carbuccia dissenting--the trial chamber rejected all reasons given by the prosecution in its appeal and ordered the immediate release of the 73-year-old former head of state and his former cabinet minister Charles Blé Goudé. Gbagbo was handed over to the ICC on November 30, 2011, and Blé Goudé was handed over on March 22, 2014. The duo has been on trial at the court based in The Hague since January 2016. Delivering the ruling on the application filed yesterday by prosecutor Fatou Bensouda, Judge Cuno Tarfusser said the prosecution had failed to demonstrate any exceptional circumstances, as required by Article 81(3)(c) of the court's Rome Statute, to justify maintaining the acquitted individuals in detention. In rejecting the prosecutor's arguments, two of three judges found that Gbagbo and Blé Goudé were not a flight risk, and dismissed prosecution arguments that there was a high probability that the appeal against their acquittal would succeed. Bensouda cited Judge Carbuccia's desire for the trial to continue as indicative of a high probability that her office's appeal against acquittal could succeed. In the ruling, Judge Tarfusser said acquittal of the accused before they presented their evidence showed, in the view of the majority, "how exceptionally weak the prosecution evidence is." On Tuesday, Trial Chamber I judges acquitted Gbagbo and Blé Goudé of all charges of crimes against humanity. By a majority, Judge Carbuccia dissenting, they determined that there was no need for the defense to present its evidence since the prosecution had failed to satisfy the burden of proof in relation to several core elements of the case. 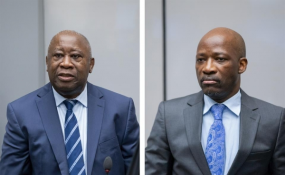 Judges today directed the court's Registry to obtain the necessary assurances from the accused and their lawyers that Gbagbo and Blé Goudé would return to the court if required. Persons acquitted by the ICC pending appeals may be required to sign letters assuring a return to the court if needed, and to produce commitment letters from governments that are ready to welcome them. Judge Tarfusser noted that the appeals chamber had powers to stay the acquittal pending the appeal. He added that, considering the time required to make the necessary logistical, organizational, and diplomatic arrangements for the release of acquitted persons from the ICC detention center, the prosecutor had "ample time" to lodge its request to the appeals chamber. In her appeal, Bensouda suggested that if the accused were to be released, judges should impose stringent conditions on them, such as release to a country in Europe near The Hague to facilitate their continued attendance at trial, requiring them to provide their addresses and contact information, not moving from these addresses or to other countries without court's authorization, and surrender of their passports. Other proposed conditions the prosecutor proposed were reporting weekly to law enforcement authorities of the states where they would be released; not making any contact with any prosecution witnesses or anybody interviewed in ongoing investigations in Ivory Coast; and not making any public statements concerning the case. Judges refused to impose any conditions to the acquittal. In rejecting the flight risk argument, judges noted that Gbagbo and Blé Goudé had recognized the court's jurisdiction and undertaken to return to the court if and when their presence was required. In the hearing earlier in the day, defense lawyers argued that the acquittal of the accused was an incentive for them to not abscond from justice. Read the original article on International Justice Monitor. Copyright © 2019 International Justice Monitor. All rights reserved. Distributed by AllAfrica Global Media (allAfrica.com). To contact the copyright holder directly for corrections — or for permission to republish or make other authorized use of this material, click here. Africa: Trial Fatigue - Is the Public Still Interested in Following Ongwen's Case?